I had the opportunity to talk with Eli Prinsen and Michael Phillips. We talked a little bit about The Sacrificed and the new album, “III”. 1. So how are you guys doing? 2. Can you provide a brief history of the band and how it was formed? Eli: We formed back in 2005. I met Johnny Bowden when he was playing in a band called “The Undisputed”. Johnny had a really good, modern groove to his playing that I hadn’t really heard before, but really liked. I had just finished a brief reunion with my old band, “Sealed Fate” and was thinking about doing a solo project. Johnny was really into early Queensryche, and was into my classic metal vocal style. 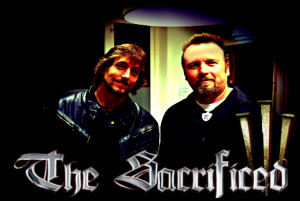 He suggested that we record a song together, just to see how our styles would mesh, the result was “The Sacrificed”. 3 .Could you tell us a little about the new release that came out this past February? Eli: “III” is the name of our new album. It’s the most “metal” album we’ve produced to date. The production is finally on a professional level and we have added two new members to our line up, guitar shredder, Michael Phillips (Deliverance, Fasedown) and bassist, Daniel Cordova (Vengeance Rising). One thing anyone who has our 1st two albums knows is that The Sacrificed plays several genres of metal within each album, ranging from melodic to power metal. This time we’ve kicked it up a few notches. There’s some technical metal flavorings as well as some traditional speed/power metal flavorings. It’s got all the shredding solos that our 1st two albums were lacking, as well as a gust solo from Roy Z (Halford, Bruce Dickenson). 4. What’s the message you are trying to convey through your music? Eli: As always, we like to send out a message of forgiveness and redemption through Jesus Christ, and also, we like to tell Bible stories and touch on controversial topics that a lot of other bands shy away from. Michael: also, talking about the struggle between the flesh and spirit that we all go through, None of us are super Christians and I think you also see that in the Bible, Jesus chose 12 men to be his disciples and they all had problems, I know I am forgiven by the finished work of Christ, but I feel　like I am going to hell every day and need a savior every day. I think as long as we are transparent and not trying to hide sin ,we can experience a peace unlike any other. 5. What turn of events happened to bring a veteran like Michael into the band? Eli: Deliverance was scheduled to play Nordic Fest 2010. Unfortunately, founding member, Jimmy P. Brown II couldn’t make it. Jimmy gave his blessing to the rest of the band to find a stand in for him so that Deliverance could still play the festival. Jimmy has some really big shoes to fill due to his ability to play some really intense guitar, as well as sing at the same time. For this reason, lead guitarist, Michael Phillips, hired an incredible session guitarist to fill the guitar half of Jimmy, and then got in touch with me through Bill (Roxx Productions). They heard me sing “Slay the wicked”, on the Deliverance tribute album and felt like I could at least sound very similar to Jimmy. I was reluctant at first because Jimmy IS Deliverance, and I wasn’t sure how the fans would react. In the end, I went through with it and it was an experience that will stay with me for a lifetime. The fans were welcoming and understanding and the gig went very well. Anyways, Mike and I formed a friendship in Norway and have been friends every since. At first I asked him if he’d help me out with some solos for the album, which he did, but then I just came right out and said, “Dude, do you want to be in The Sacrificed”? And he later said yes. 6. So Mike, what do you think you bring to the band? Michael: I think a bit of a different approach to writing songs. My primary style is technical metal and with Eli’s voice its a perfect match. Also lead guitar that was missing in the first 2 recordings. 7. How do you record an album since members of the band live on both the East and West coasts? Eli: We track Jay’s drums in Auburndale, Florida at Pasture studios, we then send those tracks through the internet to Mike, he then re records all the rhythm guitar tracks as well as the solos, he then sends a mix to Daniel, who records the bass tracks in George Ochoa’s studio, then he sends the bass tracks back to Mike, then I get a full scratch mix that I use to record the vocal tracks with here in Lakeland, Florida. I then send the vocal tracks to Mike and the final mixing takes place. Michael: Its very interesting, I think we all learned so much that the next effort will be easier, this album was　a LOT of work, more so than anything else I’ve done,(other than Mirror’s).Eli pretty much gave me the reigns　of producing and engineering　and I gave it everything I had. I didn’t want to disappoint the guys, so I spent countless hours mixing and even flew Eli to my studio for a week so we could really fine tune the mix. There are things we wish could be better but all in all we are very happy with it. 8. I see you teamed up with Bill again on the new release.. How was that? Eli: We had originally signed with Intense Millennium Records to release “III” through, but a few revisions to our contract were made which involved Divine Metal Distribution. Bill is a very energetic and hard working guy who is committed to what he does. It’s been a rocky road for everyone in the music industry lately, with the economy the way it’s been and internet piracy making it difficult on working musicians and labels, but Bill hasn’t wavered a bit and continues to serve The Lord through his efforts within the Christian metal music community. Michael: Bill has been such a blessing in my life and has become one of my good friends, he also puts everything he has into his bands. 9. Eli, you have some amazing vocals and Mike, I always love to watch you play guitar.. So what were some of your influences for the vocal style and guitar playing ? Eli: My vocal influences are Geoff Tate, Josh Kramer, Rob Halford, Michael Kiske, Bruce Dickenson, Kevin Ayers, Rey Parra, Tony Harnell, Jim Gillette, Bon Scott, Jimmy P. Brown II and Brad Delp. Michael: as far as guitarists…Eddie Van Halen, Alex Liefson, Yngwie Malmsteen, Martin Barre(Jethro Tull),Randy Rhodes, Neal Morse, Tony Macalpine, John Petrucci, Al Dimeola, David Gilmour, Warren Dimartini, that’s off the top of my head. There are many more including guys I’ve played with that are relatively unknown. Jimmy Brown(I think we know who he is LOL)Donny Anderson, Dave Bogue (Vid Payne),Bernard Bolivar, Mike Dana, are a few greats I’ve worked with. 10. Who is the main writer of your lyrics and music? Eli: Now with Mike in the band, it will be an equal amount of writing both musically and lyrically. 11. How do you share your faith with your fans? Eli: Recording wise, through both the lyrical and emotionally driven music we play. Live wise, the same way, but in personal conversation both before and after shows. We’re very personable (no rock star egos here). 12. Does The Sacrificed play a lot of live shows? Eli: Up to this point we’ve only played a handful of shows here in Florida, and now that Mike and Daniel are in the band and live all the way on the west coast, we have a lot more in travel expenses to make it happen, but where there’s a will, there’s a way and God’s will – will be done. 13. Any parting words of wisdom? Eli: Let go and let God! Also, I just want to thank Dale and Metal Pulse Radio for all the years of friendship and support, and thank the fans for sticking with us since the beginning, and most importantly, I want to thank The Lord for allowing me to be a part of this band and ministry. Michael: Try to live in the moment and enjoy each day as if it were your last and keep things in perspective. 1. God, 2. Family, 3. Work, 4. whatever else…At the end of the sermon on the mount Jesus said “be perfect as your heavenly father is perfect”. One of the disciples　asked how is that possible, Jesus said with man it is impossible but with God all things are possible. As Jesus was preaching ,the crowd got smaller and smaller and discouraged at these difficult if not impossible teachings,　until the disciples were the only ones there　and Jesus asked them,” Do you also wish to go”?and Peter said, “Lord, where else would we go”…that answer has not changed for those of us in Christ. 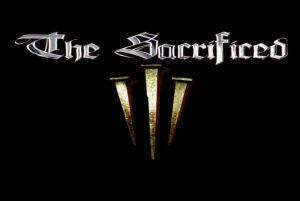 Check out The Sacrificed on Facebook!